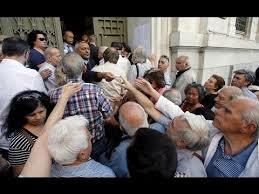 Angry crowd gathers at the entrance to a closed bank in Greece. If there really is a super-charged atmosphere in Greece, then what would happen if some small group simply forced open the doors of some of the banks? We are reading that every day there are hundreds or maybe thousands of people gathered outside the banks. They must be both scared and angry. If the doors were forced open, would they just go in and refuse to leave? If so, then you have the start of occupation of the banks. wouldn’t take much to get those who are occupying the individual banks to start communicating with each other – first maybe by Twitter and the like and then in person. But the individual branch banks are just the branches of the central monster. Isn’t the central bank the nerve center? Wouldn’t that be the next logical step – to occupy the central bank? That’s one lesson from Occupy Oakland. Sometimes talk is cheap and action is what is needed. The anarchists and similar types were ultimately proven wrong in Occupy Oakland. The movement does need a clear program and plan of action. Sometimes, though, in this period it is out of the action itself that such a program can start to develop a mass base. I don’t think there’s much point in occupying bankrupt banks if all you want is to get your money but it’s not there any more. Occupying the central bank would make sense though. We thank Philippe for his thoughts, but we think he misses the point, which is how it might be possible to help get the masses of Greeks into action. Many Marxists think that what’s necessary is a clear program and plan of action first. At least here in the USA, the Occupy movement proved that’s not always true. This is not to belittle the necessity for a program and clear plan, but maybe that will only develop once people are already in motion. Maybe if people semi-spontaneously occupy local banks, a plan can be drawn up to occupy the Central Bank as well as other locations, including the Port of Pireus, which is slated for privatization.